Sand is an important component of most of the soils and some of the rocks in our Study Area. Everyone knows sand when they see it, but what makes sand, sand, when it isn’t on a beach? Sediments like sand are defined by the size of their particles. Sand grains are larger than silt and clay particles, and smaller than granules and pebbles. Sand grains range from 1/16 mm (63 microns) to 2 mm in diameter. They all come from previously existing, broken-down rocks. Most of the sand we know begins as interlocking crystals in igneous or metamorphic rocks, as in the granite at right. The typical minerals are clear quartz, feldspar, and dark micas or hornblende. Already they will have a fascinating petrographic history, decipherable from the size of the crystals, the proportions of light and dark minerals, and the nature of any impurities or inclusions. But our story here starts when erosion separates the crystals into loose grains, and transports them away from their source rock. When they are first released, the crystals are irregular in shape. If the erosion involves grinding or impact, very thin edges and sharp points result (left). The broken surfaces are clean and clear. As the new sand is tumbled in a river or ground up in a landslide, these delicate points begin to break off, and the grains gradually become blockier and more rounded. But even in a river, a sand grain spends most of its time sitting still with the river flowing over it, and the changes may take many, many thousands of years. Meanwhile, the softer minerals like feldspar wear away and eventually dissolve, ultimately leaving only the supremely durable quartz grains. 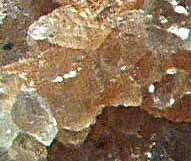 A sample of sand grains that includes much pinkish feldspar indicates that the sand is fairly close to its source rock, in time and distance. The images here were all magnified through a microscope and obtained with a digital camera. 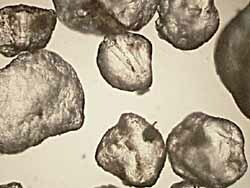 These sand grains were generally between about 0.05 and 0.25 mm (50 to 250 microns) in diameter. Our Study Area’s most unusual sand grains are remarkable for their roundness. 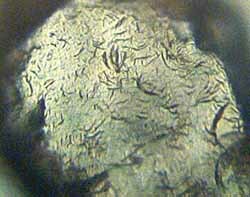 They were once well travelled particles, but they have been safely locked away in solid rock for 450 million years. They are currently weathering out of the early Ordovician dolomite that forms outcrops and boulders in among our study trees. This dark gray sedimentary rock is studded with white sand grains that stick out more and more as the rock around them dissolves. So much of the gray rock has dissolved and washed away since the end of the Ice Age that these grains now make up the bulk of the soil immediately around the outcrops. Originally, these sand grains would have been tiny crystals in the granites that formed great mountains where the Gatineau Hills are now. Those mountains were slowly worn down through the ages, and the released grains were weathered and worn until only the quartz remained. Quantities of pure sand were laid down in shallow seas close by. We know the result as Nepean sandstone, which is exposed in the southern end of the Study Area, complete with fossilized ripple marks. As the waters deepened, mud-like sediments were laid over the sands. For a while, sand grains continued to be washed into the sea, to be incorporated into the lower layers of what has since become dolomite — a limestone that contains magnesium. 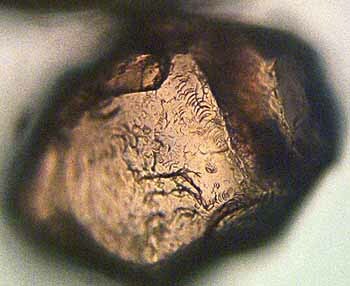 This period in their history is when these sand grains acquired the feature that makes them special. Tumbling down rivers, rolled about on beaches, and blown into great dunes by the wind, all of the grains weathering out of the dolomite, even the smallest, are strongly rounded. The surfaces of these grains are also completely covered by a clear mineral coating, which forms a microscopic pattern of irregular plates and ridges (shown at right, and again at left, even more highly magnified). This coating does not appear on grains that are now in the same soil, but have had other origins. Presumably it formed before being deposited in the sediment that became dolomite. What will become of these grains in their new environment? Will they will be washed away by stream and river to some new beach, or buried in place and solidified into some new rock? Only geological time will tell. Away from the sandy dolomite outcrops, the sand grains in our Study Area soils are quite different. The first thing to notice is that many of them are irregularly broken — but with blunted points and thick edges. Similar sand grains are found in the Pakenham Hills, where we often go for field trips, and in many other locations in the region. The fractures on these grains were produced during the Ice Age, when sand grains were held fast in slowly moving glacial ice, and ground against other rock particles. Not enough time has passed for the surfaces to weather; not enough has happened to these grains since the ice melted to wear away the angular edges, or mar the relatively fresh surfaces. On the surfaces of these grains, the marks made by the glaciers are sometimes visible. 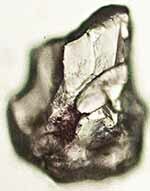 There are crescent-shaped cracks or gouges. These often run in trains and are commonly called chattermarks. They were produced by one rock fragment being dragged across another under high pressure within the ice, and are characteristic of glacial activity. 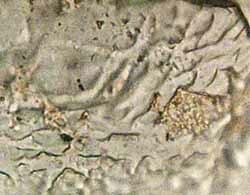 Very much larger chattermarks, commonly 10 cm across, can be seen on glacially polished bedrock, especially in the south end of the Study Area. The feldspar grain at right also appears to bear a deep-furrow feature, which is considered to be a sign of transport in a continental glacier. 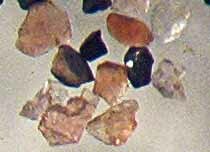 These sand grains are in sediments that were left behind by the glaciers, as indicated by the prevalence of rocks that do not come from the local bedrock. Our Study Area, for instance, is underlain by sandstone and dolomite, but the bulk of the rocks in pioneer stone piles and stone walls are granites and gneisses. Such rocks were carried out of the north by the flow of glacier ice from the Gatineua Hills and deposited here. What happened between the old and the young? The world went on during those hundreds of millions of years, but in the end left no trace here. While rich fossil beds were being laid down in epoch after epoch elsewhere, in the Ottawa region the net result was erosion and removal of that record. Ultimately the last of the several Ice Ages completely swept away even the deposits of its predecessors before dropping its own load of glacial till. The soils of our Study Area are basically those same glacial tills. The past was almost erased by that glacier, but not entirely. 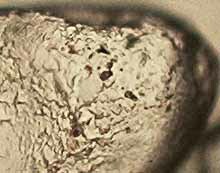 In any sample there are a few sand grains that still bear the marks of some previous existence. At the Study Area we sometimes see a few of the rounded, intricately coated grains from the Ordovician dolomites mixed in with the freshly fractured glacial grains, though none of the source rock is immediately evident. There are also quartz grains much marked with glacial chattermarks that are not fresh-looking, but are instead deeply eroded, as if preweathered in a time between glaciations. How could these sand grains get into a glacier that grinds its own sand out of solid rock? A beach may draw its sand from a river, and a continental glacier picks up whatever lies in its path — beach sand, river sand, sand left by earlier glaciers. If the glacier deposits its load quite soon, these grains are preserved; othewise, they are eventually all crushed and ground up anew. Harder to understand, perhaps, is how old sand grains could have survived long enough to be picked up at the end of the glacial period. But it happens that there are places of refuge, and sometimes the shifting flow of ice dips into previously untouched deposits in protected hollows, and mixes the old into the new. As the ice slides on these old grains become scattered, and scarce, but there is a place in Ontario where the ice seems to have ground to a halt immediately after scooping up just such a body of old, preweathered soil. At the Sheguiandah archaeological site on Manitoulin Island, artifacts argued to have been made by humans before the last glaciation lie in sediments that have been the focus of controversy for 50 years. It was thought that these sediments were glacial till from the most recent advance of the ice — they have all the signs of it, such as a complete range of particle sizes, from clay to sand and pebbles to boulders. Some of the stones bear the abraded faces or facets, and deep scratches or striations typical of glacial till. In recent years, microscopic examination of the sand grains has shown that even they were marked by the glacier. There are crescentic gouges, deep furrows, and fractures — but apparently all were chemically weathered to such an extent as to indicate they were derived from deposits left over from some previous glaciation. All photos taken by R.E. Lee from Study Area (or Ottawa-area) samples. Last updated July 7, 2004. Coding revised in 2012 and 2016.